Vacation in Paradise: Our Family has made our home the perfect vacation getaway. Perched on Sarasota Bay with spectacular water and city-scape views from the multi-level decks; Walk to the world renowned Longboat Key beach at the end of our street. 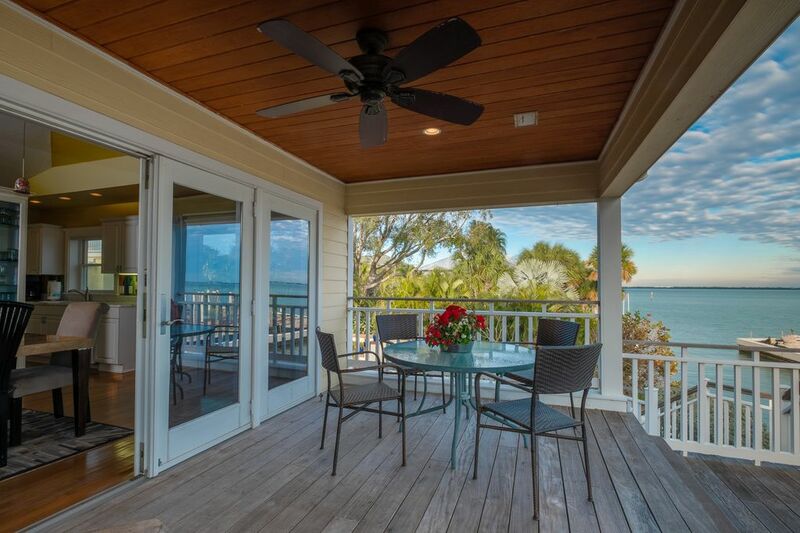 Your family will be enthralled by Longboat Key's natural beauty and laid back atmosphere. A short walk to relaxed and upscale restaurants alike. You'll find shopping and beach front parks at nearby St. Armands Circle and Sarasota. Our house has great water views of Sarasota Bay and the Sarasota skyline. Quiet and private. Private beach access at the end of the street. Heated pool, spa hot tub, great amenities. Feel the breeze on the decks as you sip your martini and listen to music. Additional Services: We will arrange fishing charters, catered meals, a personal chef, in-home massages, golf tee times at acclaimed Ritz Carlton Beach Club Golf Course, and numerous other services upon request (charges for services are set by vendor). OUR HOME IS TOTALLY NON SMOKING; INSIDE AND OUTSIDE. IF YOU SMOKE THIS MAY NOT BE THE PLACE FOR YOU. We are experienced travelers who expect quality accommodations and responsive service. Our mission is to provide our guests this same quality we expect. Why Not? Where can you get a better view and value. We can arrange golfing, massage, fishing, yoga, kyaking services to enhance your visit. We are a short walk to the finest restaurants on Longboat Key. On Sarasota Bay with dock for your boat or fishing, water views of city; you walk to beach and Gulf of Mexico. Pool area reminds me of European villa; Heated: Winter months only additional charge for heating. Spa is outside and overlooks water and view of city. Beautiful property with fantastic views! Enjoyed every minute in this beautiful house. The private swimming pool & jacuzzi was very relaxing. The upstairs deck was amazing. Beds & pillows were very comfy! Would highly recommend this property to friends & family. Had a fantastic time! We are so pleased your family enjoyed their stay at Tarawitt.. We recently replaced the pool service and the pool is looking great under new management. The location and house where great however we had a few issues. The pool was not the cleanest when we arrived and by the end of the week I had to call because it was green. However the owner sent the pool guy the next day! The is really only a two bedroom house. The 3rd room is not contained to the central AC and very hot down there. The elevator is the only access unless you go outside. The cleaning crew was still there when I arrived on my first day and they most definitely didn’t dust. There was also some mold in the master bathroom along with living room vents/speakers. I apologize for the pool not being up to our standards. This company is fairly new and I will now replace them because it is very important to maintain the highest standards. The third bedroom on the lower level has its own dedicated air conditioning unit in the wall which is very efficient. This room is only accessible by the elevator and that is why we prefer that small children do not occupy this space for sleeping. Thank you for your comments on our cleaning crew. I intend to let them know they need to improve on the quality of their work. We absolutely loved this place. The location was great and the pool was amazing. The walk to the beach was a little longer than expected but no big deal. We loved the sound system throughout the house and the sunrises from the deck were breath taking. Would definitely recommend this home to anyone thinking of a trip to Longboat Key. The house is beautiful with outstanding views of the water. We saw manatees and Dolphins. Rented kayaks and bikes to explore the great area. We had a blast! My wife and I brought our two boys over for a relaxing week in Longboat Key. We had never been before and would highly recommend it to all! Very relaxing and a short walk to the beautiful beach. Great restaurants and everyone we met was very nice. We will be back! Amazing views, relaxing, close to everything. We had a wonderful time. The home is clean and well maintained. It was as described, and did not disappoint, especially with the views. Overall a great place to stay and is close everything you need. Jerry was very accommodating and easy to deal with. We would definitely stay here again.